Dreamer is the most famous route in Darrington, and with varied climbing at a moderate grade it is deservedly so. The route is located on a remote crag reached via a poorly maintained access route, it is ten pitches long, and the descent via rappel provides plenty of opportunities to get a rope stuck. It includes some interesting and challenging crack climbing in addition to several spectacular pitches of knobby face climbing, in a pristine mountain setting with magnificant views. The route to Green Giant Buttress starts out on an old extension of this logging road, but after a half mile drops to an older mining road. 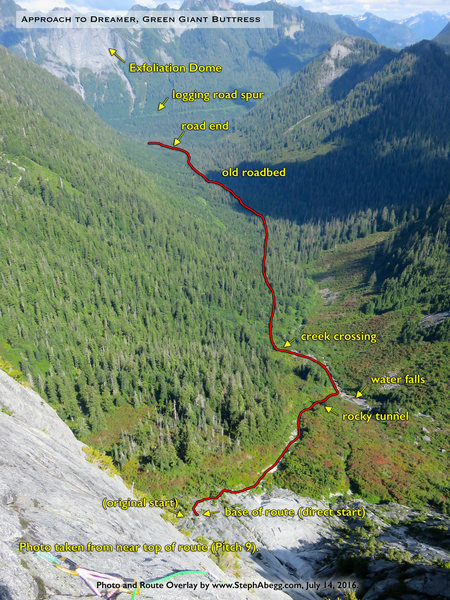 After this ends, continue on to cross a side fork of Copper Creek, bear slightly leftward and follow the main fork to a series of three waterfalls. A tiny gully heads up and right into the maples and opens up to a larger gully that is followed all the way to the base of the rock. Scramble up and right to the traditional staging area, which is a few hundred feet below steeper rock above. There is no real landmark here, but there are a few small cedars standing straight up whereas above this point everything is more bushy looking. The route requires gear to three inches. On one pitch, the "blue crack" pitch, one can save (hoard) their 1" piece lower down, but an extra piece in the 2 1/2 " - 3" range is helpful. Cool snow formation at the base. Looking down the awesome blue crack on pitch 6. More knob climbing on pitch 4. Lower Apron- Somewhere around pitch 1. Knob climbing on pitch 3. 1. Park at 6.2 miles on the road at a clearing - it gets bad quick after that. 2. On the approach, look very carefully for the gully up to the climb - if you find yourself bushwhacking steeply through maple and devil's club, you're off track. It's a rocky tunnel through the greenery, after the first stand of evergreens on the right of the stream. 3. Definitely print the topo if you don't want to get off route. Or accept that you'll have an adventure :). In the blue crack I could have used a second #2 (gold) camalot. 1) In the summer, this crag gets direct sun basically all day. So climbing on a particularly hot and sunny day with no cloud cover is kind of the worst--ok, like actually the worst. I have burn blisters on my hands and feet that will testify to that. The route (Dreamer Direct) starts near 48.1473, -121.6613. Low-angle unprotected scramble to a belay anchor at 48.1473, -121.6618, which is where pitch 1 starts. Becca! You're commentary is fantastic. My partner and I got completely f#%^ by the approach twice last June. We thought we'd spend a casual Saturday climbing Dreamer and then head to WA Pass for a casual Sunday climb as well. That did not happen, however. Saturday we spent the ENTIRE day chasing waterfalls and six hours straight bushwhacking through the gates of Mordor (aka Maple, Devils Club, etc etc etc). Worst bushwhack I've ever done and I've had my share (I actually think I may be a bit sadistic because I slightly enjoy a hearty 'schwack). We didn't see the gully on the right, so we climbed up the granite waterfall slabs for ever-DO NOT DO THIS...once we ascended high on the waterfall slabs, we could see the gully across the dense forest but could not traverse over to it because it was trending diagonally away from us; not feasible. So the next best option (seemingly at the time) was to bushwhack to the base of the granite directly from the top of the waterfall/gully-SERIOUSLY DO NOT DO THIS. There's nothing but dense forest and it will take you forever and you will become cliffed out. There's not really a safe way to scramble the cliff band over back to where Dreamer is. You essentially have to go up the gully or you're not getting there. 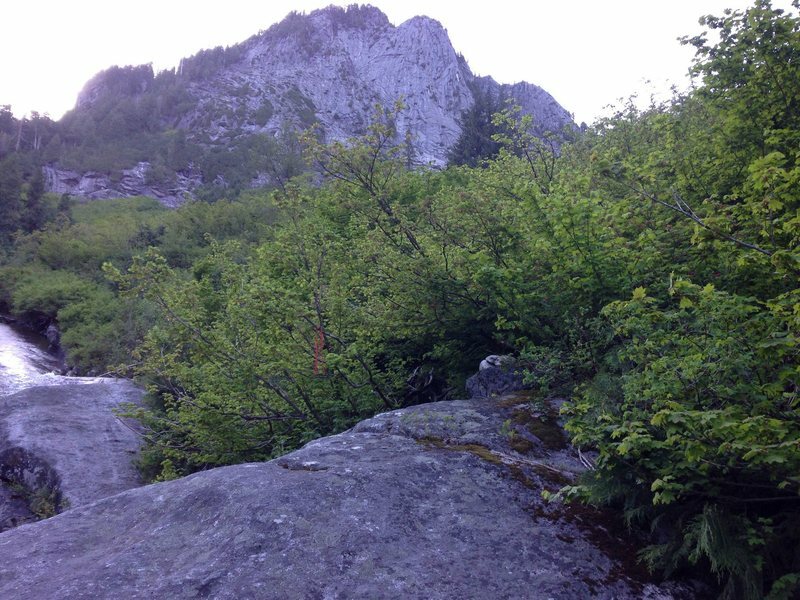 So after hours of climbing (literally) up and down alder, maple, and other pokey forest shrubs we got back to the top of the granite the waterfall runs down-down climbing that is more adventuresome (read: spicey) than the ascent is. Side note, anyone else feel the Vibram rubber on their La Sportiva shoes aren't the same confidence inspiring compound as it has been in years past??? We managed to find the gully once we got back to the base of the waterfall. No obvious cairns. The one cairn we found was up the maple/alder tunnel approximately 25-30 feet into the gully. Jeezus. What use is a cairn that's already up the trail it's marking?! So, since we didn't climb Saturday and figured out the approach (well, at least entrance to the gully), we decided to stick around and attempt the climb Sunday. Sunday morning we got a decent start from my van thinking the approach would be fast since we "knew where we were going". Well-the gully is easy enough (Becca eluded to some of the extent of it), but figuring out where the start of the climb is is another ball of wax. We finally figured it out (3rd class adventure scrambling and deciphering...all the cedar stands looked the same to us) and climbed the first three pitches before we decided to call it a day. I'm stoked to go up again this year and finish the climb...hopefully. Moral of the story: read the other comments (Serge even hooking it up with GPS coordinates!). Leave early-this is essentially an alpine climb or should be treated as such. Gully is found to the right of the base of the waterfall, maybe biased a bit before if I recall correctly. There's a maple tunnel that guards the first bit of the gully. Once in the tunnel it's an uphill slog via white granite slabs of various degrees of pitch. One weird, steep spot that is not granite slabs and is eroded; we went to the right of the erosion via root climbing, skirting the erosion until we could meet back with the obvious gully again in approx 100 yards. Would the next guy please PLEASE take a roll of bright pink trail-marking tape and mark it enough that we can all find our way there in the dark? Jon Nelson, is that a serious request? I'm heading up tomorrow and could do that. I'll update this comment with our take on the approach and climb. Update update: Forgot to mention, we got about a half-mile past the 8 mile creek trailhead, only to find the road blocked by 5 or 6 fallen birch trees. They're all 12"-18" in diameter. I'd suggest the next person bring a saw, you could easily drive in another mile. Update. Attempted the climb on 4/28. Like the person below me says, the tunnel is marked by the red webbing. I also added some pink tape up into the tunnel itself. As for the climb, we never really made it onto it. The whole feature was covered in fog even after we crossed the snowfield, so we kept looking for the "highest cedars". We made our way too far to the right, convinced ourselves that it must be the route, and started up in search of some bolts. Right when I realized that it couldn't be the route, the fog lifted and revealed the line was way to our left, separated by a gully that I couldn't get across. Turn off where at the base of the waterfall with the red rope and the cairns. The pink flags you want to follow will be inside of the tunnel, which you will find at the base of the waterfall. Turn in here to start your ascent in the boulder field towards Dreamer. To second all the comments here, this approach is long! It is a solid 2.5-3 hour approach if you are in shape and mostly know where you are going. Attempted this route on Saturday May 12. An FJ Cruiser took us to the end of the road with the help of an axe to clear fallen trees. Slept in the car to start hiking by 7am. Routefinding wasn't too difficult, just follow the pink tape into the rabbit hole after the waterfall. Most time consuming part was having to ascend the steep snow patch at the base of the wall and scrambling to find the start of the route. Took us about 2.5h total. The wall was all dry except a few small streaks of water. ~80°F cloudless skies with a slight breeze was pretty much perfect weather. Rapped after P6 and got back to the car at ~10pm. Recommendations for a mid-May climb: bring crampons for the snow patch and thick pants/shirt for bushwhacking through the thorns. Hiking poles may help to cross the streams but we used random sticks.